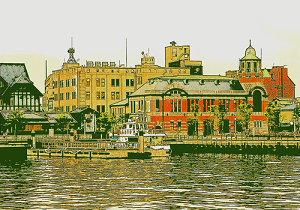 The beginning of "Grilled curry" is moji port in Kitakyushu City, Fukuoka Prefecture in the 1930s. At that time, I put eggs in the oven and baked in the leftover curry, indeed fragrant, delicious finish, in the surprise and the impression, it was put out as a menu of the shop, and there remains anecdote that it was popular... Moji port is located at the northernmost end of Kyushu, and the port town which prospered as the international trade port from the Meiji era to Showa era. Foreign ship from about 25 years after the war and mainly Showa, because a lot of crew etc. were in and out, it developed as a Western culture region quickly, and "grilled curry" was born, and it spread as a home cooking in a local dish. 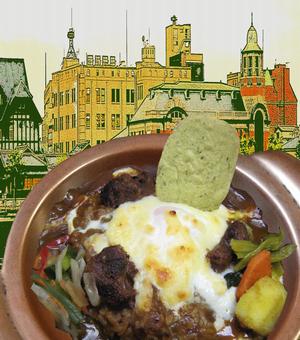 ★The curry of our store is a European curry. Please taste the "grilled curry" which expresses the deep taste and aroma with the brown Lou which was carefully stir-fry and homemade bouillon together. The secret of the taste of "grilled curry"
"Grilled curry" that can be eaten delicious until the end because it is hot! It is a habit of curry sauce on rice, eggs and a small amount of cheese, baked in the oven "grilled curry" This is exactly the delicious "original grilled curry".